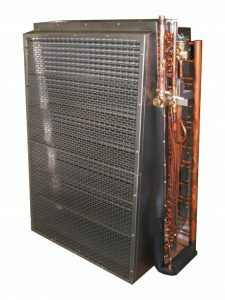 Aircooling | Dutch Thermal Engineering n.v.
DTE builds aircooling registers to client specifications and also has a serie of standard air cooling registers in its range. These are optionally fitted with fans and protective grills. These cooling registers can be supplied in 2 variations. As direct expansion blocks for Freon or as water/glycol cooled blocks for a water/glycol mixture of e.g. 0°C. Our cooling registers are made of Stainless Steel with copper pipes and aluminium grills. On request we can also produce these completely in Stainless Steel or with a coating. 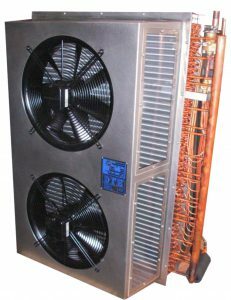 Naturally we also supply the accompanying condensing units or water/glycol coolers, optionally with advanced temperature regulation. The folder shows a sample of the possibilities, but please contact us if you need more information or an explanation on all the possibilities DTE has on aircooling.